I just knew this book would get my brain in a swirl and I was so right. There were sections I loved and sections I groaned my way through. This book is full of journeys, physical and metaphorical. 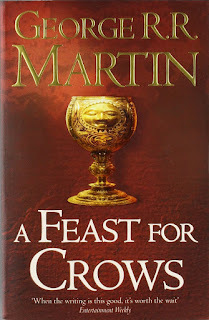 Sam’s sea voyage to Braavos and beyond, Brienne’s fruitless search for Sansa, Myrcella’s trek across the Dornish desert, Arya’s ‘journey’ within the temple at Braavos. I loved all the extra detail about Samwell’s journey to Oldtown with Maester Aemon which the TV series only skirts over. I equally loved seeing John Snow grow from a young boy consumed by uncertainty into a youthful though excellent Lord Commander of the Nights Watch. I worried for the decisions I knew this new responsibility would impose on him. But I needn’t have feared. John Snow, having seen his father’s style of command, knows that every good leader must make hard choices and he makes them despite his youth. This book deals with the fact that often a prejudice can be reinforced by the very people we assume would be fighting it. Pratchett demonstrates this through the character of Granny Weatherwax. I’ve read some of the Tiffany Aching books in which she is remembered for her wisdom and practical kindness. So it is a great pleasure to finally meet her. I simply love Granny Weatherwax’s pragmatic no nonsense approach to life, probably because in many ways she reminds me a great deal of a less cosmopolitan version of my mother. Though my mother claimed to be feminist she sometimes perpetrated very non-feminist ideals. Granny certainly behaves in this way and supports a system of a male dominated sphere of learning because that is how it has always been. 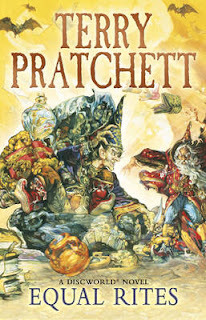 Thankfully, Pratchett uses the character of Eskarina and her magical staff to readjust Granny Weatherwax’s views. This month my blog is 5 years old. It seems like only yesterday my toddler was a squalling babe in arms. The exact moment of conception can be pinpointed to when I stepped into the upstairs room of a former chandelier shop on Tower Bridge Road. I believe the insemination date can be pinned down precisely to the first Saturday of April 2013. What pray tell was I doing in the upstairs room of a former chandelier shop? I was there to do an Emily Benet blogging course naturally. My marvellous friend Sydney Blake was meant to be there you see. Unfortunately a family crisis prevented her from attending. So I went in her place, just to take notes and eventually feedback on the ins and outs of what it takes to put a blog together.But silver tongued Emily Benet made this blogging business all so very enticing. How could I possibly resist the allure of it?Before I knew where I was, a seed had been planted in what turned out to be very fertile mind muck and much was now germinating. So I’m launching another book this Easter. It’s a collection of vignettes related to characters from Six Dead Men and its prequel, Palindrome. I can’t call this a collection of short stories because in truth the pieces are really a moment in various characters’ lives. As these character snapshots link the two books in The Robert Deed series, I’ve decided to call it Six Degrees. And how exactly did this collection come about? Well, when you write a novel, peripheral characters often ask you to tell their side of the story. At times their voices are so loud and persistent in your head that they are hard to ignore. This was indeed the case with characters from both Six Dead Men and Palindrome. So Six Degrees was born out of this. But it also grew out of my desire to play with the short story form while trying my hand at Flash Fiction. I’ve since sent two of the stories off to Mslexia’s annual short story competition and now have nails bitten down to the quick.